What is driving the hybridization of school design? The traditional boundaries between secondary and post-secondary are being challenged. As the cost of higher education has escalated, there are an increasing number of high school students enrolled in dual credit and advanced placement courses that qualify for college credit. 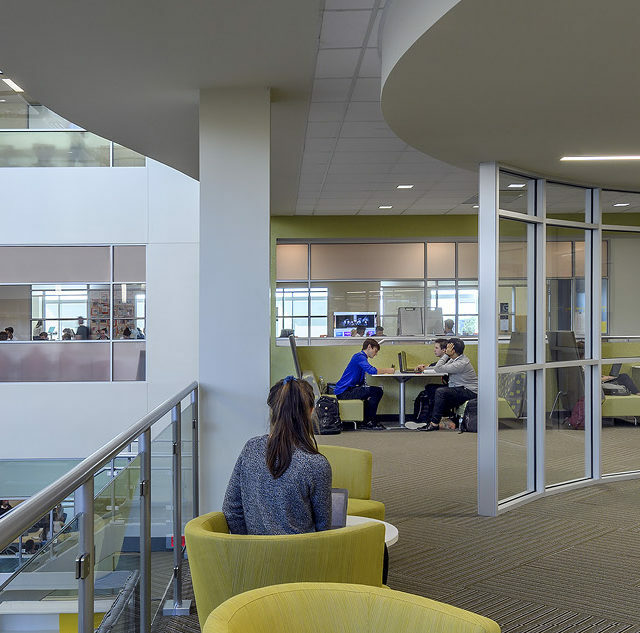 In response, high school spaces are beginning to look more like collegiate spaces, taking cues from the collaborative and creative atmospheres of higher education and Silicon Valley. Additionally, technology advancements and cultural factors have quickened the trend. What’s clear is this movement isn’t showing signs of slowing, as more school districts look to build or redevelop spaces that reenergize the classroom and accelerate student achievement. A business incubator lab at Round Lake High School teaches students future-ready skills to prepare them for careers. Let’s take a look at the drivers of this trend and see how they can help us better understand the evolution toward hybrid school spaces. There are still schools that limit the use of smartphones during school hours, but increasingly districts have embraced the fact that most students are walking around with a supercomputer in their hands, or have completely made the jump to incorporating mobile devices into the curriculum. In the 21st century high school, students are not tied to their desks listening to a teacher lecture at the front of the room. They move around, congregate in shifting groups for different projects and learning experiences. Teachers are seen more as coaches or Sherpas. It’s the collegiate model transposed to the high school setting, where upper classmen are given more responsibility and flexibility in how they learn. New or redesigned school buildings reflect this change. Hybridization is occurring because educators have discovered that students really learn well when they’re working together. Teachers assign projects that require collaborative skills and develop solid communication. 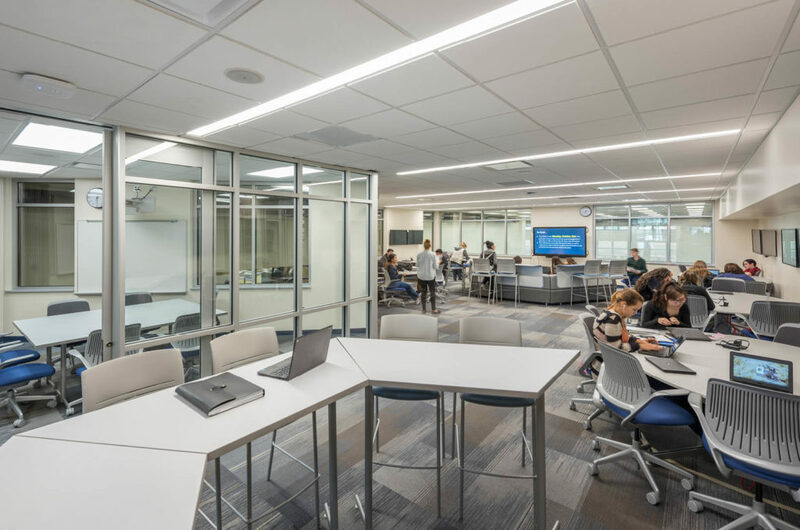 Modern school designs are offering an environment where sharing is easier, and entrepreneurial spaces allow for more effective hands-on learning and real-world experience. 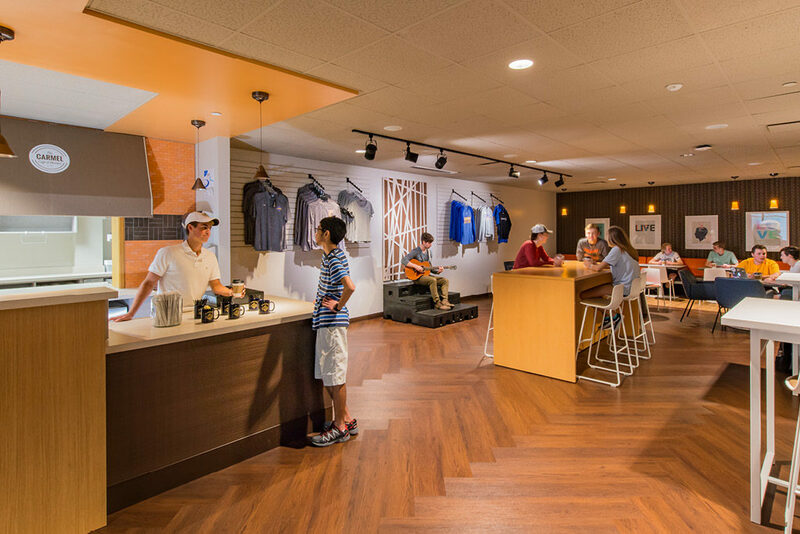 At Carmel High School in Indiana, the DECA Club is having great success running a Starbucks-like café business in a space that was remodeled just for them. A prominent location was chosen on the school’s main thoroughfare and has quickly become a landing spot for students and staff alike. The renovated Carmel Café gives students an inspiring setting to gain real-world business experience. Another factor for hybridization is the simple reality that public schools are facing more competition from private and charter schools, and even each other. This is especially significant from a financial standpoint as state funding is typically associated with each student, so if they switch schools, education dollars flow with them. As a result, there’s a real feeling among public school leaders that they need to adopt new models in how they deliver education and services to their students, which in turn will affect how they’re perceived by the broader community. In a lot of ways, public schools are not being given enough credit for what they’ve done in the face of this competition. They’re becoming more transparent and inviting the community (taxpayers) in to show who they are. In addition, they’re reaching out to local and regional business leaders to partner in education initiatives and share their knowledge as guest instructors and mentors. Educational leaders realize they need to compete to show their value and to build trust in their communities. 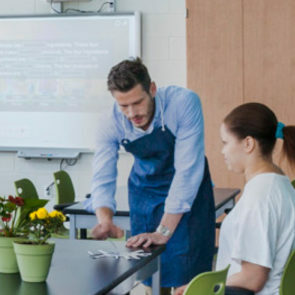 Having facilities that support new modes of learning can go a long way toward building a stable and healthy relationship between schools and their stakeholders. High school educators are finding that most students are able to handle the new freedoms they’re afforded with the right guidance—especially juniors and seniors. The cultural shift is to make students more future-ready by treating them in much the same way they would in a college or university setting. If schools look more like the next step in life, whether higher education or the workforce, they better prepare students for those transitions by requiring them to take an active role in their education and personal responsibility for their progress. So next generation high schools are reflecting wider trends in the real world. Media centers are merging with cafes which are blending with entrepreneurial-type spaces. Gymnasiums and athletic spaces are moving toward health and wellness uses which are merging with community outreach and partnerships. The concept of classrooms themselves is being rethought as the technology to teach and learn has opened the entire campus to opportunities for learning. I can’t think of a more exciting time to design spaces that support and inspire students and teachers. How can your school transform learning opportunities and provide a rich base for education in your community?